Even if winters are not as cold as they used to be, nobody likes the chilly weather. It is the season when we turn the heat up and find a cozy spot. Sometimes, the heating system might not be able to cope and maintain a proper temperature. Other times, the temperature might not be low enough to be worth to turn on the heating system. In all these cases, people turn to one of the most convenient alternatives which are an electric blanket. Even if some people have the impression that they are not safe, things have changed significantly as technology improved. Safety features have been implemented to improve their reliability and make them an easy to reach and simple solution to get warm during the cold season. A regular electric blanket uses heating wires inserted inside the blanket itself. More recently made electric contain safety mechanisms that monitor the heating wires and prevents them from overheating. These systems are fairly simple and work quite well. What could not be improved much by technology is their energy efficiency. Electric blankets do need a good amount of electricity. The material from which the blankets are made can vary a lot. Some are better at retaining heat while others are not that great. Modern blankets can also use carbon fiber elements that make them less bulky. Also, advanced blankets can have a rheostat that can be used to regulate the heat based on body temperature which ensures a comfortable experience. 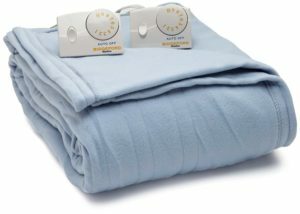 Regular blankets tend to have just a regular thermostat that just regulates the heat and can be adjusted by the user. Also, they need to comply with certain safety standards in order to be sold to end-customers. With all these things said let’s jump right into our list of recommendations for the top 10 best electric blankets in 2019. Serta electric heated blanket is a great option for the ones that simply hate the winter. It is a large blanket made out of polyester with a safe and patented technology that prevents it from overheating and saves energy. The wiring inside can barely be noticed but has a small knob that can be used to adjust the heating level. For safety reasons, the blanket will automatically shut-off after 10 hours. As for comfort, the material is very soft and the blanket itself can be found in 4 different sizes and 5 colors. The blanket is made out of multiple layers of fabric in order to improve efficiency and for safety reasons. Some of the layers have a higher tolerance for high temperatures. This makes it thick and heavy. There are models that are a bit lighter than the Serta electric heated blanket. Sunbeam makes a rather affordable and decent electric blanket. The model is made out of a soft polyester fabric with a fleece exterior. 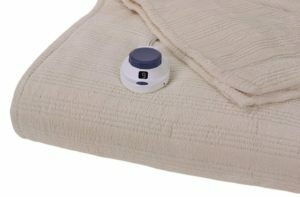 It has a small thermostat with just a single button that can be used to turn on the blanket and select one of the 3 heating levels. One interesting aspect is the fact that the blanket is wash machine safe. The blanket itself is not as thick as some of the other blanket and it is lighter, making it more comfortable for the user. Even if the manufacturers stated that the blanket is made out of a fleece material, it is not very soft. It is decent but it is a bit misleading. The blanket does have the texture of a fleece one but it is a bit on the rough side. It is still good enough to use. Serta heated electric blanket is a great pick for everyone that is looking for something on the budget side. 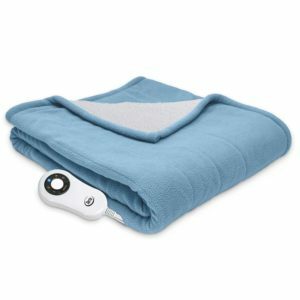 This inexpensive blanket measures 50 by 60 inches and comes with 5 heat levels that can be adjusted using the small remote that comes out from one of the sides. It is made entirely out of polyester and has a fleece exterior. 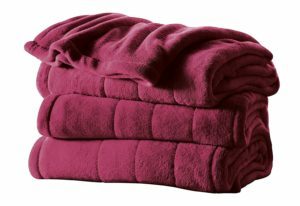 The blanket is stated to be machine wash safe and includes a 3-year warranty. Last but not least, the power cord measures 8.5 feet which should be long enough. The blanket works quite well but it does not get very warm. It is good enough but some might want it to get a bit warmer. On the other side, the fact that it does not heat very hard makes it safe and prevents it from overheating that could lead to some undesired accidents. 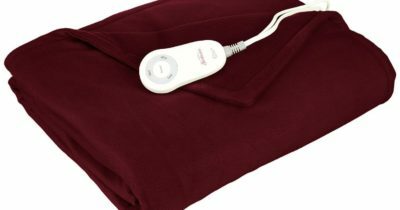 Sunbeam heater electric blanket is a great pick for the ones that are looking for a good deal. 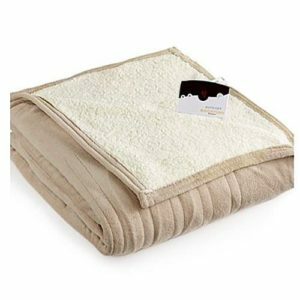 It is an inexpensive blanket has a soft fleche fabric made out of polyester and it is quite lightweight. The model comes with a simple remote with a large dial that makes it very easy to adjust the heat level. For a heated electric blanket, the wiring is well hidden and comes with automatic shut-off that prevents it from overheating. It also comes with a 5-year warranty as a bonus. The fabric from which the blanket is made is quite thin. This makes it heat up quite hard at the highest setting. The way around this is to just avoid the highest heat setting. Using it might cause the blanket to heat too much and become too uncomfortable to use. 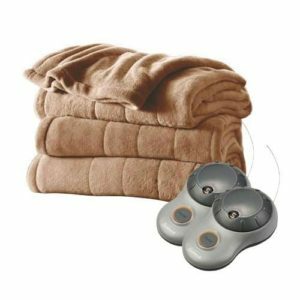 Biddeford MicroPlush electric heated blanket is a very popular pick mainly because it is big and it does not cost all that much. The model has a digital control dial that allows the user to choose out of 10 heat settings. It has also been fitted with an automatic shut-off feature that prevents it from overheating. As for maintenance, the blanket is easy to clean since it is machine wash safe. It is made out of a soft polyester material and has a very thin wire that is barely noticeable. The blanket has 10 levels of the heat settings. Past the 5th level, the blanket can get a bit too hot. The auto shut-off system does not turn it off meaning that it is normal for the blanket to become very hot. As long as it is used in a decent heat setting, the blanket will not pose much of an issue. 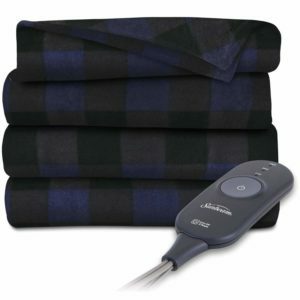 The Biddeford heated electric blanket is one of the more expensive models on our list but it is also superior from several points of view. For an electric heated blanket, it is not as thick and heavy. The wires are well hidden and it is machine washable. Complementary to the blanket, a zipper bag is included. As for heat settings, the blanket has 10 levels and auto shut-off protection. The model also has 2 controllers and comes with a 5-year warranty. The blanket appears to get warm enough only at the highest settings. At the lower ones, it barely warms up. This can be annoying since the first 5 heat levels appear to have no utility at all. Sunbeam velvet plush blanket is a very popular pick for the ones that are looking for a more reliable product. It is made out of a soft polyester material and has 2 heat zones. The blanket has a preheat feature and 20 different heat settings. 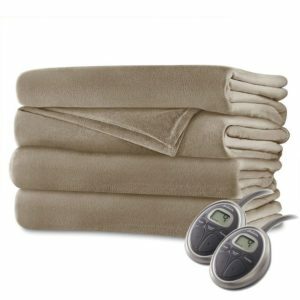 It is a machine washable blanket with well-hidden wires and comes with 2 digital controllers. Additionally, the blanket has a self-adjusting feature that maintains the same temperature based on the heat setting. In terms of safety, it has an automatic shut-off and comes with a 5-year warranty. Being a dual heating zone blanket and having 2 controllers means that it has more wiring than usual. It also has several protecting layers that add up and make the blanket quite heavy. It is still soft but the ones that do not like heavy blankets might want to check out other models. 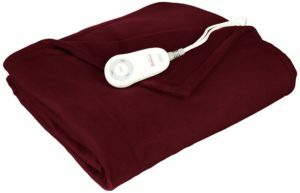 The Sunbeam fleece heater electric blanket is one of the cheaper models but it still offers decent quality. It is made out of polyester and it is machine-washable and dryer safe. The fleche material is quite soft and very comfortable. The controller offers just 3 heat settings and has a 2-hour auto shut-off function. As for comfort, the blanket auto-adjusts itself to maintain the same temperature. Last but not least the blanket comes with a 5-year warranty. The blanket is actually a throw blanket. This means that it is quite small. Fortunately, the manufacturers do offer the blanket in multiple sizes and colors to choose from. The smallest one can be just a bit too small. 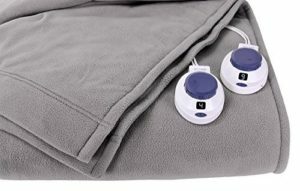 Sunbeam Microplush heated electric blanket is a hot seller mainly because it is very soft and not that heavy. The blanket has 10 heat settings and an automatic shut-off function with a 10-hour timer. Like most other blankets in our list, it is made out of polyester and comes with 2 controllers. It also has a pre-heat feature and a digital display for the controllers. The manufacturers offer the blanket in multiple sizes and several different colors. The wiring inside is not properly distributed which causes the blanket to hot heat evenly. Most other blankets do not have such an issue. The heat zone gaps are not that large but they are noticeable. SoftHeat offers a great electric heated blanket that is both safe and easy to use. The blanket is machine wash safely dryable. It is made out of a soft polyester fabric with well-hidden wires and proper stitching. For safety, the manufacturers added an automatic shut-off after 10 hours of use and multiple heating levels. The controller has a backlit display and it is very easy to use. Last but not least, the blanket has a pre-heat function and can maintain a constant temperature for each heat setting. The blanket comes with long cords that are easy to connect. The only issue with it is that the cords get disconnect easily. It is possible to disconnect it by accident by pulling the blanket. There is a great degree of diversity when it comes to electric blankets. We have a lot of different brands and all sorts of blankets of various sizes and performance levels. Picking one can be a bit difficult since there are a lot that seems purchase worth. Regardless, not all blankets are created equal and there are some interesting differences between them but there are also some important features that should not be disregarded. Safety: A decent electric blanket needs to have an auto shut-off system. Most of them will turn-off after 10 hours but there are a few models that have overheat protection. Heat levels: All electric blankets have adjustable heat levels. Some do not get warm enough even at the highest setting and such issues are only revealed by the reviews of buyers that already tried a particular blanket. Size: The size of the blanket is important. Some of them are too small while others are just too big. This is also another aspect that is related to the size of a blanket. The bigger the blanket, the more power it will need to run. It is best to just get the right size in order to avoid wasting money on the energy bill.